If you are a chocolate lover like I am, you might think that there is no better treat on a hot Summer day than a fudge-flavored freezer pop. And I would have agreed with you until I got this latest batch of samples from Nuzest, that contained a couple of pouches of REAL COFFEE flavored protein powder. I knew immediately that MOCHA freezer pops were on my Summer must try list. 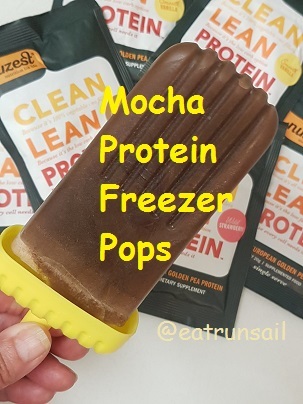 I love the flavors of coffee and chocolate blended together... and with the added benefit of low carb vegan protein, and no added sugars, what could be more perfect? So I whipped them up this morning, and they are fabulous! 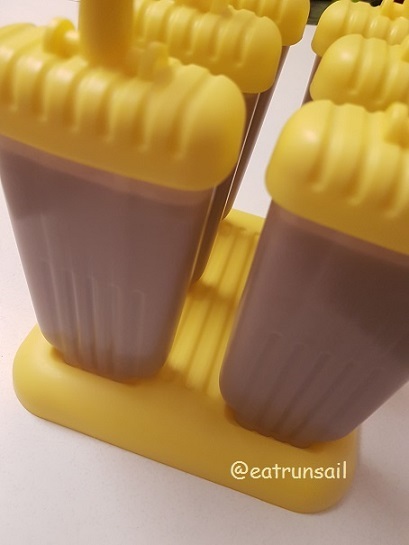 I have a few different freezer pop molds, and this particular set is a favorite. I won it in a giveaway a few years ago from Kristina who writes the plant-based recipe blog spabetti, (and if you haven't checked her out, you must) and have used it a lot since then. It is a good quality plastic and the handles/sticks fit securely into the molds, which sit snugly and firmly in the base. No worry about spills in the freezer. Nice bonus. And it makes good sized treats. The first thing you will want to do is find out how much volume your freezer pops hold. I know from experience that mine hold 3 cups. So, I used a packet each of Nuzest Rich Chocolate and Real Coffee protein powders, 2-1/2 cups of unsweetend almond milk and 1/2 cup of leftover cold coffee. You can vary your liquid ingredients according to your own freezer pop measurements, and if you have some leftovers, drink up and enjoy! Now I know that not everyone is an almond milk fan. If you prefer, use another nut milk, or even cow's milk if you drink it. 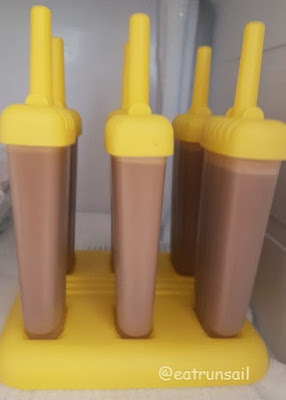 After assembling my freezer pops, I blended the ingredients together in a large measuring cup and then carefully poured it out evenly into each mold. If you haven't made quite enough you can top them off with more almond milk or more coffee... just make sure to leave a small space at the top of each so they will not overflow when you set the stick into the liquid. and put them in your freezer for a few hours until they are firmly set. The hard part is waiting for them to freeze solid... but once they have, you will know it was worth it! These make not only a delicious and healthy treat on a hot day, they are also a good quickie pre-workout/run treat for those of us who like to get it done first thing in the morning. They have just over 7g of protein each and only 43 calories. And if you use regular coffee, there will also be a wee bit of caffeine too... which is nice pre-workout as well. 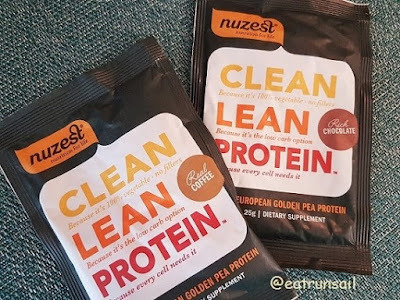 If you want to order CLEAN LEAN PROTEIN, or any of the other terrific new products from Nuzest you can get 15% off your order with my discount code eatrunsail and don't forget that shipping to the U.S. or Canada is free with an order of at least $50. So, are you a freezer pop fan too? And what about flavors? Chocolate or Mocha? Cannot go wrong with coffee in a popsicle right?! 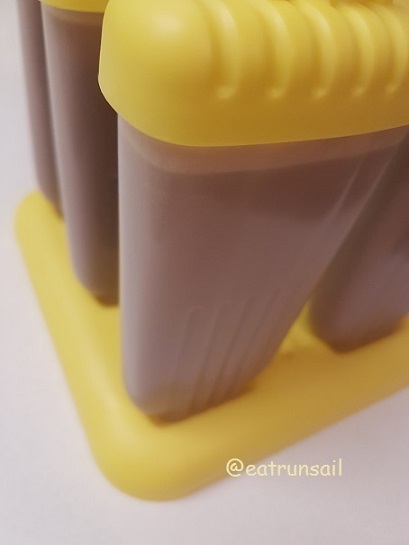 I'm a total freezer pop fan and I make popsicles with Nuun hydration to enjoy after a long run! I've only ever made the Nuun-cicles once and they didn't turn out all that great. I just wish I had more time to "make" things :) These look good! I made popsicles once. They looked and smelled good but tasted bland. I bet yours are better! I really need to get some popsicle molds. These look really good and perfect for the hot weather. I haven't had luck with popsicles. The same thing tasted great as a juice blend but once I freeze it - blah. I'd eat these! I know my sons would! Yum. I am more of an ice cream girl, but this flavor sounds amazing. Wow, these look awesome! Coffee added? Yes, please! Coffee in a Popsicle?! Yes please! What a fabulous idea! I'll bet they tasted great! I haven't had much luck with homemade popsicles, but these look pretty fool proof! That is a great idea to make freezer pops with it! I've only done it with juices. Would much rather have a chocolate one like yours! Your popsicles look wayyy prettier than the ones I make! *-* These look so tasty!